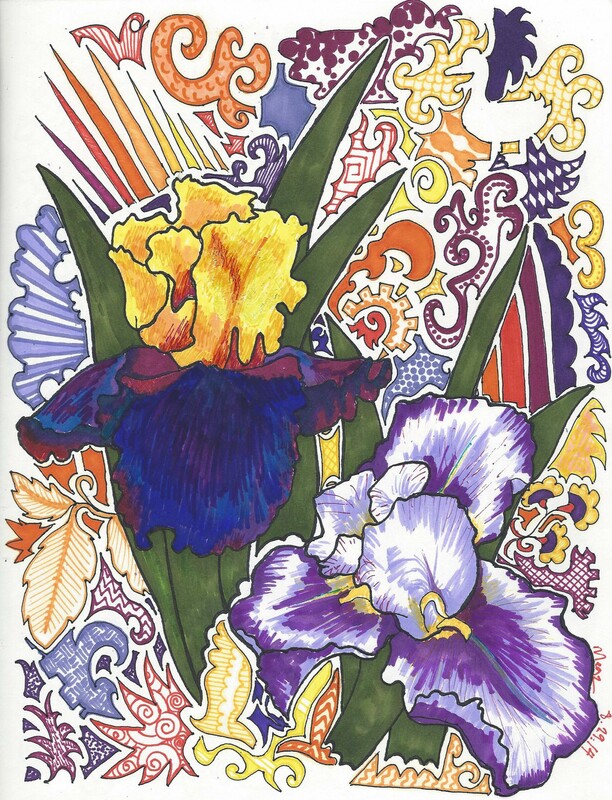 So, I finally bit the bullet and completed the Iris State Flower drawing I started in January. It wasn’t that terrible and I really love the way they turned out. I love drawing with oranges and yellows and even the purple looks pretty good. I’m thinking my next flower doodle will be of a Hibiscus, the State Flower of Hawaii. I’ve never been there, but MrE lived there when he was a child. Maybe I’ll do all the states he has lived in next. Also, Kittens. 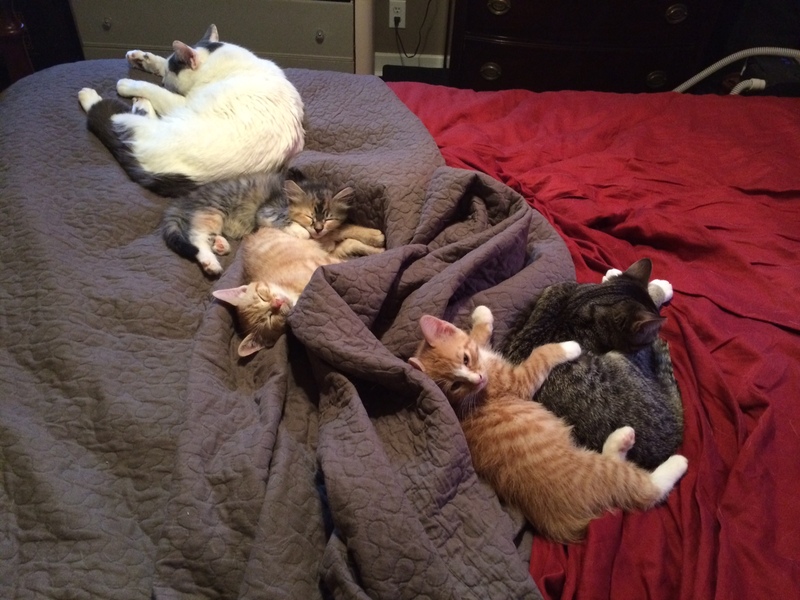 Look at how adorable all the cats are snuggling on my messy bed. We are still looking for homes for them, and we have a month to do it before we leave to move to COLORADO! Yay! MrE applied and was offered a different job within Lockheed Martin. He will continue to save the world, but this time he will be an Engineer. His new department has no clue how lucky they are. My parents have all sorts of beautiful and distinct Irises in their yard, and most of them are Bearded Irises like the ones I used as reference for my doodle. I love dark and vibrant irises, and one of my favorite varieties is actually brown. I had to white out the text I wrote in the flower in a fit of pique, but you can hardly tell it was ever there, unless you see the drawing in person. Oh well. I also finished another doodle from a few months back. 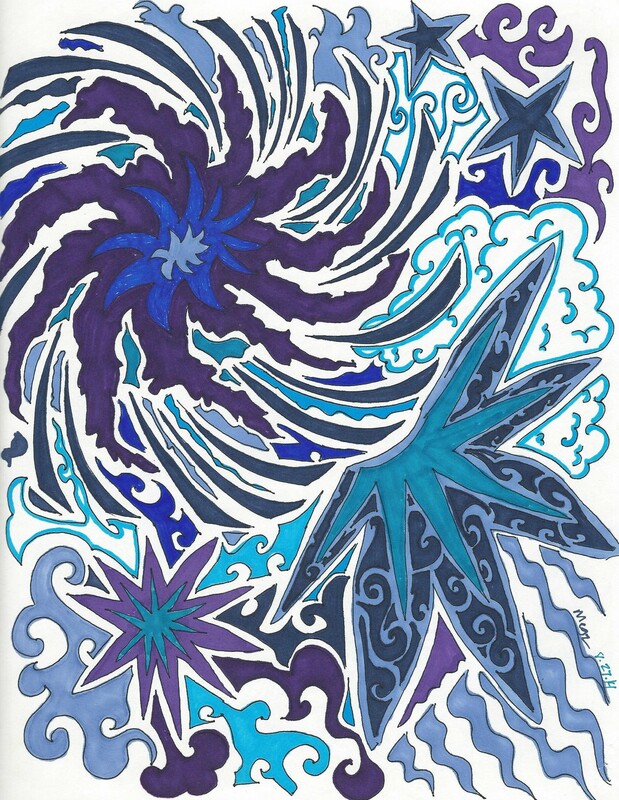 this one was inspired by Cosmos, and has a swirly-spacey vibe I think. That’s it for now. I will continue to draw some new doodles and hopefully continue my State Flower projects, and maybe color in another forgotten drawing.